In Amherst, Gideon Ariel is putting athletes' movements into computers and coming up with ways to improve performance. In Amherst, Gideon Ariel is putting athletes' movements into computers and coming up with ways to improve performance. The applications of technology to games is apparently the wave of the future, and, to Ariel, the future is now. According to Gideon Ariel, people one day will wear biomechanical clothing. They will run on packaged air and will lift weights with a computer. Nothing is so outrageous that it cannot be discussed. Most things of this nature, in fact, have made the 39-year-old Israeli scientist richer. 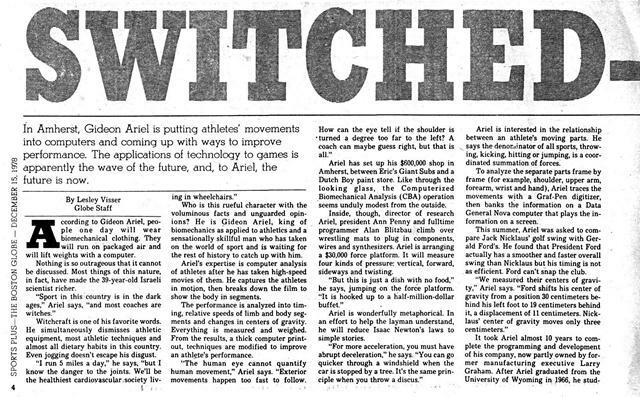 "Sport in this country is in the dark ages," Ariel says, "and most coaches are witches." Witchcraft is one of his favorite words. Ile simultaneously dismisses athletic equipment, most athletic techniques and almost all dietary habits in this country. Even jogging doesn't escape his disgust. Who is this rueful character with the voluminous facts and unguarded opinions? 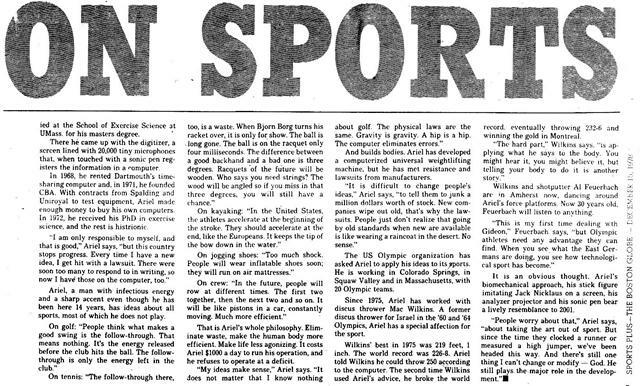 He is Gideon Ariel, king of biomechanics as applied to athletics and a sensationally skillful man who has taken on the world of sport and is waiting for the rest of history to catch up with him. Ariel's expertise is computer analysis of athletes after he has taken high-speed movies of them. He captures the athletes in motion, then breaks down the film to show the body in segments. The performance is analyzed into timing, relative speeds of limb and body segments and changes in centers of gravity. Everything is measured and weighed. 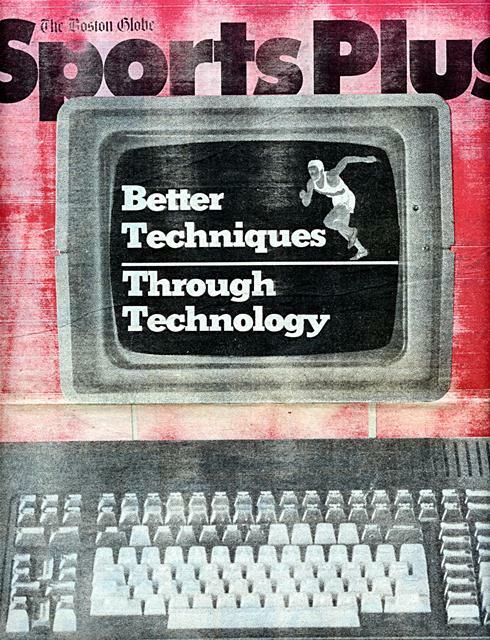 From the results, a thick computer printout, techniques are modified to improve an athlete's performance. "The human eye cannot quantify human movement," Ariel says. "Exterior movements happen too fast to follow. How can the eye tell if the shoulder is *turned a degree too far to the left? A coach can maybe guess right, but that is all." Ariel has set up his $600,000 shop in Amherst, between Eric's Giant Subs and a Dutch Boy paint store. 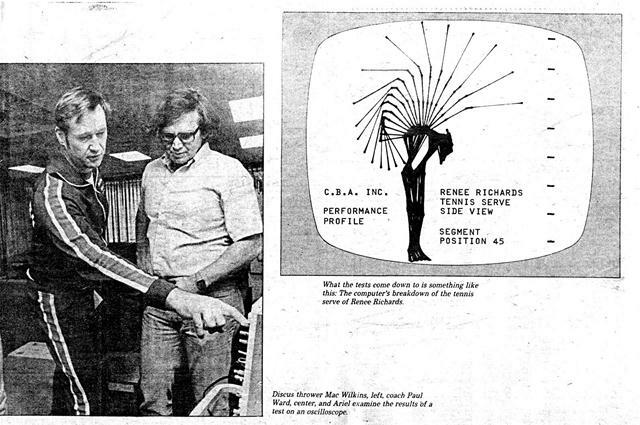 Like through the looking glass, the Computerized Biomechanical Analysis (CBA) operation seems unduly modest from the outside. Inside, though, director of research Ariel, president Ann Penny and fulltime programmer Alan Blitzbau climb over wrestling mats to plug in components, wires and synthesizers. Ariel is arranging a $30,000 force platform. It will measure four kinds of pressure: vertical, forward, sideways and twisting. Ariel is wonderfully metaphorical. In an effort to help the layman understand, he will reduce Isaac Newton's laws to simple stories. "For more acceleration, you must have abrupt deceleration," he says. "You can go quicker through a windshield when the car is stopped by a tree. It's the same principle when you throw a discus." Ariel is interested in the relationship between an athlete's moving parts. He says the denominator of all sports, throwing, kicking, hitting or jumping, is a coordinated summation of forces. To analyze the separate parts frame by frame (for example, shoulder, upper arm, forearm, wrist and hand), Ariel traces the movements with a Graf-Pen digitizer, then banks the information on a Data General Nova computer that plays the information on a screen. 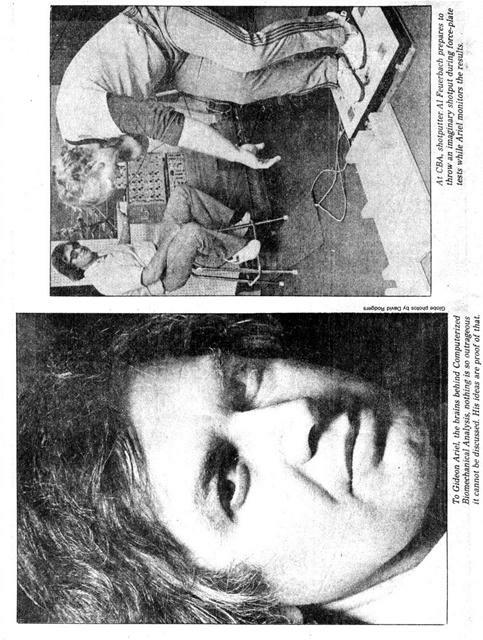 This summer, Ariel was asked to compare Jack Nicklaus' golf swing with Gerald Ford's. He found that President Ford actually has a smoother and faster overall swing than Nicklaus but his timing is not as efficient. Ford can't snap the club. "We measured their centers of gravity," Ariel says. "Ford shifts his center of gravity from a position 30 centimeters behind his left foot to 19 centimeters behind it, a displacement of 11 centimeters. Nicklaus' center of gravity moves only three centimeters." Generated on 4/22/2019 5:56:41 PM (PST) ADI/HQ/GBA/2019/ARIELCLOUD/v3.0.2018.0126.